Ordinance No. 18, Series of 2014 - Ordinance Requiring Tricycle Drivers Permit. Ordinance No. 23, Series of 2014 - Ordinance Amending Section 85h Colorum tricycle for hire of the Transportation and Traffic Code. Ordinance No. 2, Series of 2010 - Regulating Vehicular Vans in the City of Vigan. Ordinance No.6,Series of 2007- Amending Transportation Code one way 7am-7pm. Ordinance No.6,Series of 2008-Amending the schedule of fares for tricycle for hire and Section 85(I) of Transpo Code. Ordinance No.8,Series of 2006-Regulating the use of Carburetor two-stroke engines by tricycle for hire. Ordinance No.12,Series of 2008 - Right Side Parallel Parking Amendment to Transport Code. Ordinance No.13,Series of 2006 - Amending Section 31 of the Transportation and Traffic Code. Ordinance No.16,Series of 2006 - Amending Sec. 27 of Transportation and Traffic Code. Ordinance No.18,Series of 2008 - Revised schedule of fares for tricycles. 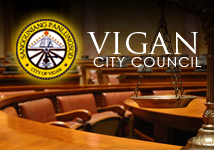 Ordinance No.27, Series of 2005 - Transportation and Traffic Code of Vigan.